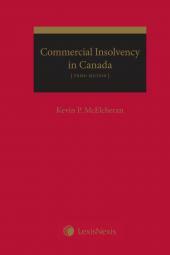 This newsletter provides timely insights into, and analysis of, developments in the law and other matters affecting commercial insolvency in Canada. While the focus is on bankruptcy and insolvency, the work is not restricted to these topics. Also covered are secured transactions, creditors' rights and the shareholders' "oppression remedy". TheReporter is much more than a simple digest of cases or a compendium of case comments. 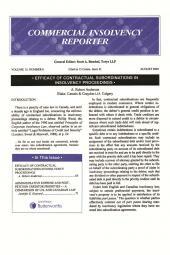 The contributors examine recent legislative changes and offer analysis of current issues in the law. Commercial Insolvency Reporter is available in three convenient subscription formats: Print Only, Print + PDF or PDF only. The PDF version can be posted on your firm's Intranet so that all staff may benefit from this information-packed newsletter. Please note that the PDF version may be used for Internal Distribution only.